A mob of black-clad youths barged into a Chicago restaurant yesterday and started beating diners with hammers and batons. It was the middle of the lunch rush Saturday, and Mike Winston was working in the kitchen of his Tinley Park restaurant, the Ashford House, when a waitress screamed a fight had broken out in the dining room. Police call the melee at the restaurant a targeted assault by a mob that Winston said wielded metal batons and hammers. Ten diners were hurt in the attack, and three of those were hospitalized. Tinley Park police had five suspected assailants in custody, and Winston said 18 young men, all wearing hooded jackets and obscuring their faces with scarves and other coverings, stormed into the restaurant. “They came running in the door single file,” said Winston, who owns Ashford House, 7959 W. 159th St., and the adjacent Winston’s Market. Winston, and police, said the men knew who their targets were, and that the attack wasn’t a random act of violence. Winston said the mob “targeted” a group of 20 diners, all of whom were from out of state. “Once they attacked the table, they went and started hitting random people,” Winston said. A group calling itself the “Anti-Racist Action Group” took credit for the targeted beating. On Saturday, May 19th a group of 30 anti-fascists descended upon Ashford House restaurant in the Chicago suburb of Tinley Park where the 5th annual White Nationalist Economic Summit and Illinois White Nationalist Meet-and-Greet was taking place. The White Nationalists were targeted inside the restaurant and physically attacked, causing several injuries and completely shutting down their meeting. 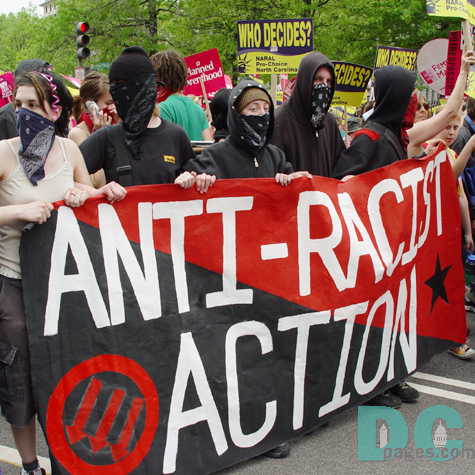 The anti-fascist group was privy to anonymous inside information. This fascist event had been in secret planning for six months. The attendees have attempted to cover up the true intent of the event with mainstream media reports initially reporting the white nationalist conference as a wedding party and then as an Irish heritage meeting. The event was advertised on www.stormfront.org, an established white nationalist fascist internet forum. A.R.A is a network of regular people, together to solve a problem. We intend to do the hard work necessary to decrease racism, sexism, anti-gay bigotry, anti-racism, and the unfairness which is often suffered by the disabled, the youngest, the oldest, and the poorest of our people. We confront hatemongers like the KKK and other white supremacists. Every Time they come out we want to be there. We won’t stand by and watch these terrorists recruit. No dues, No commitment. Just a chance to change the world. Do it for the victims. Do it for the children. Do it NOW before it’s too late. Anti-racists: Beating presumed fascists in the head with hammers, one swing at a time.